Pork tenderloin is a tender cut of meat that is cut from the spine part of the pig. It can be prepared a number of ways from grilling to frying and every way in between. One popular way of cooking pork tenderloin is on a rotisserie grill or in a rotisserie oven. Put the pork tenderloin into a deep pan and pour a half cup of extra virgin olive oil directly on top of it. Liberally shake garlic powder, onion powder, ground sage and Greek seasoning salt into the pan containing the pork. Roll the tenderloin around to evenly coat it in the seasoning and oil mixture. 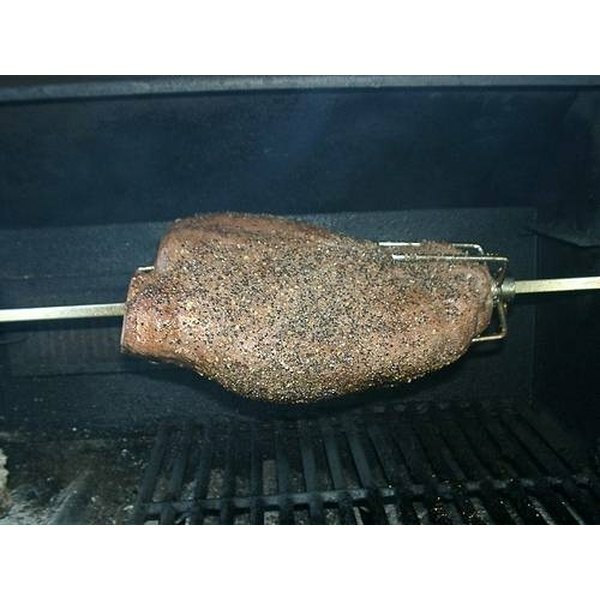 Put the seasoned tenderloin on the rotisserie and slow roast it for about an hour and a half. Serve with traditional barbecue side dishes like potato salad and baked beans. Use a household rotisserie oven to make a British-inspired meal using simple ingredients. Preheat the rotisserie to 450 degrees F and put a broiling pan on the lowest rack. Insert the spit into the tenderloin and secure the prongs on each side. Season it lightly with lemon pepper and sage and put it in the oven. After it has cooked in the rotisserie oven for about an hour, remove the broiler pan and pour the drippings into a baking dish to make Yorkshire Pudding. Put the pan of Yorkshire pudding on the bottom rack under the pork tenderloin and let it cook together for 30 minutes. Serve with gravy and peas. Create a Mexican dish using rotisserie-grilled pork tenderloin. Season the meat with cumin, chili powder, garlic salt and minced onion. Let it slow-cook on the rotisserie for about two hours, or until the meat begins to slide off of the spit. Serve with lime wedges, corn tortillas and a variety of salsa vegetables. For added flavor, split the tenderloin down the middle and stuff it with jalapenos and cheese. Roll it tightly and bind it with chef's string before cooking it. What Is a Good Way to Cook Cubed Pork?